Recently in August 2016 Bangalore Puzzle Meet, Anti Knight Sudoku was introduced and there were many tough Sudoku puzzles which we practiced in this meet and learned many different techniques to solve this Sudoku type. Inspired from this experience, I tried to create couple of Anti Knight Sudoku puzzles. One puzzle created turned out to be very tough which I will publish here some other time. 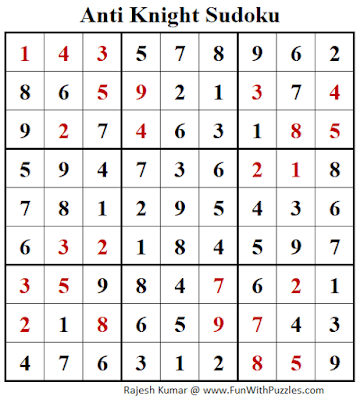 The current Anti Knight Sudoku puzzle is not very tough and is an easy puzzle. While creating this puzzle came up very well. However at the end to make this puzzle unique, I have to give additional 2 hints in the center which made this Sudoku easy. Prasanna took around 2.59 minutes to solve this Sudoku. Lets see if you can beat his timings. 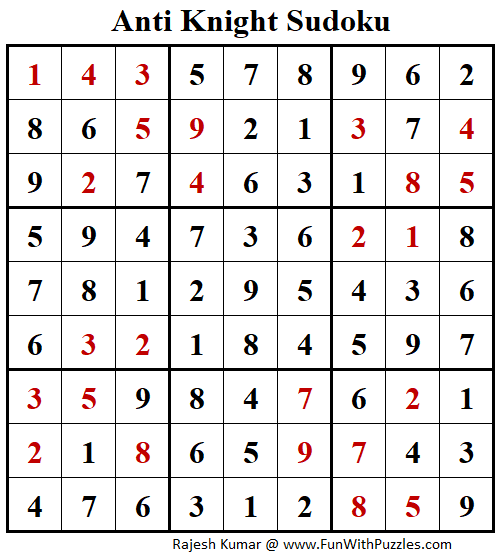 I am posting this Anti Knight Sudoku in Fun With Sudoku Series as 216th puzzle in this series. Here is Answer of Sudoku Puzzle Titled "Anti Knight Sudoku Puzzle (Fun With Sudoku #265)"
Yes, this one was easy one. which is little tricky one :).